I came across Burn Zombie Burn through the nice "You might also like..." section of Google Play's games store. It caught my eye because it reminded me, visually at least, of one of my favorite games of all time- Zombies Ate My Neighbors- and it turned out to indeed be a game I did like. 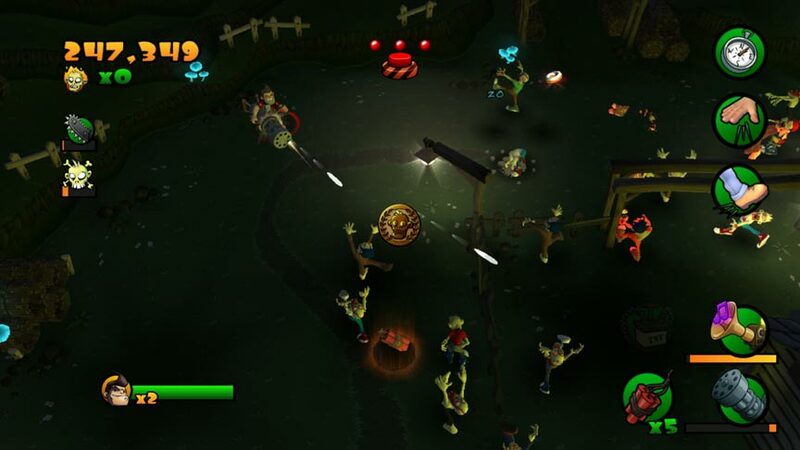 Burn Zombie Burn is a top down arena shooter full of hordes of zombies that you need to slaughter. Sounds simple and fun right? Well, that's where it gets really interesting. The score multiplier is compounded by burning things. Yes, the title comes into direct effect here. You need to light things up and them slay everything you can with any weapons you can get a hold of, and there are a lot of them to choose from. You have your simple torch, a vast array of guns, dynamite, and even a lawnmower to pick up and kill every thing you can. 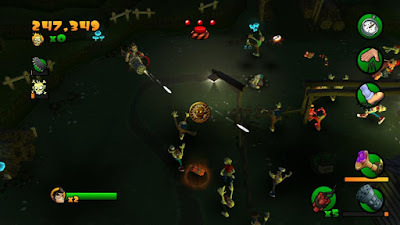 Many of them are even nods to great zombie films that would appeal to the exact type of player the game wants, as is the main character's name- Bruce. Almost undoubtedly a reference to the Evil Dead's Bruce Campbell. Lighting things on fire is easy of course, but managing the flame can get a bit troublesome. I've found myself on numerous occasions being caught between a horde and a fence on fire, leading to my impending doom. This sets up a wonderful risk versus reward form of gameplay and it is extremely satisfying here. The downsides are that there are only a handful of maps in three different modes to play, some challenges, and even a multiplayer option. But that really isn't too limiting here as Burn Zombie Burn surprisingly hangs on to the fun factor and it's small and highly replayable nature is appealing in small doses, always leaving me wanting to play just one more round trying to chase a higher score than the last one.